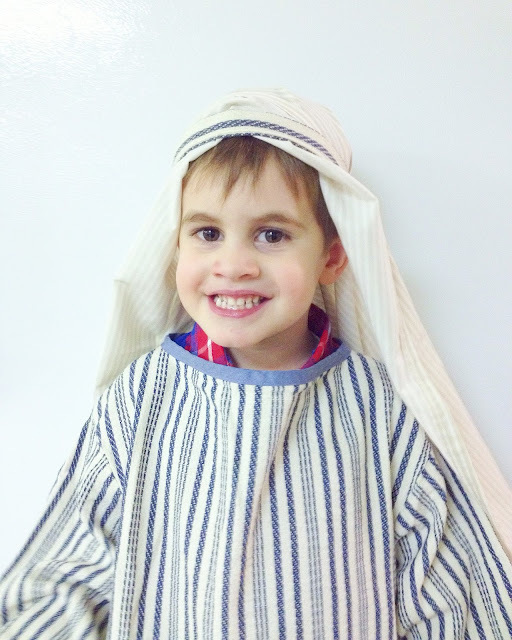 Nolan was so excited to be a part of the Christmas program at church this year! He originally wanted to be a sheep, but we decided that a shepherd was a better idea. That way, Hammie the dog could be his sheep ;) He enjoyed memorizing the shepherds' song, and for weeks before the show, he would sing lines from the song at the top of his lungs around the house, "Suddenly, a great company of the heavenly hosts appeared with the angels!" I was a little nervous that he would try to sneak off-stage or steal the show, but he did pretty well! He was constantly moving, and ended up in the lap of his Sunday School teacher, Michele, but he did his best! After the kids were done, we did an "open mic" music night, and Steve wrapped up the show with a lively rendition of "Snoopy's Christmas" (the Red Baron song). It was really good!